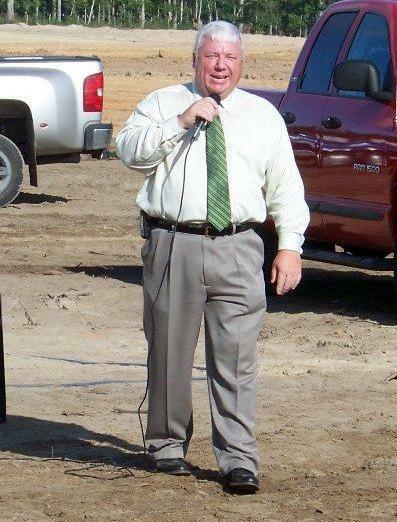 Dr. Darrell Myers addresses gathering at the LISD High School ground breaking ceremony in 2009. After a Job Well Done, It's Time to Move On, LIVINGSTON, March 23, 2014 - LISD Superintendent, Dr. Darrell Myers will be moving on as he has accepted a job as Cleveland ISD Superintendent. Under Myers' guidance, LISD saw the construction new high school and is currently in the process of a new elementary school. The old high school building has now been remodeled and is now the intermediate school. The old intermediate school has also been remodeled and will now become Cedar Grove Elementary School. Additionally, there will be a new gymnasium built at Cedar Grove. Myers stated that when he came to Livingston, there was an agenda of items that needed to be fixed. "We've gotten them done", Myers said. "Academically, I'm proud of our faculty and our administrative team". "They've worked real hard to improve the academics and have done so over the past several years". Myers stated that Cleveland is similar to where Livingston was when he first came here, "Cleveland has some issues that are very similar to what Livingston was facing when I first came here" he said. "The demographics and the community of Cleveland is very similar to Livingston, and I think that with my skill set, I can go down there and help that community", he said. "I appreciate all of the opportunities afforded me by the LISD Board of Trustees and my Lion Friends", he said. "Livingston ISD will always hold a special place in my heart".